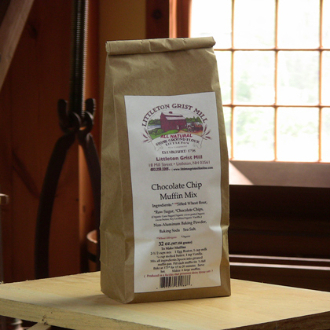 Our Chocolate Chip Muffin Mix is made with our sifted white wheat flour. (All-Purpose) and lots of chocolate chips. Adding 1/4 c. applesauce or yogurt makes moister muffins.. Ingredients:All Purpose(Sifted Wheat)Flour,Raw Sugar,Chocolate Chips,Baking Powder,Sea Salt,BakingSoda. Caution: Chocolate Chips are processed in a facility that processes nuts. Contains Allergens.